Epoxytec Mortartec Ceramico is a next generation, epoxy modified mortar. A highly advanced, formulated epoxy blend incorporating cutting-edge epoxide technology with proprietary engineered curing agents; combined with a specific balance of Portland cement, hardened ceramics, graded silica aggregate, synthetic fibers and silica fume to produce one of the most coveted mortars in the industrial market today. This results in a smooth mortar application with the hardest surface in the industry once cured. The Mortartec Ceramico exhibits excellent acid resistance, with incredible adhesive properties, barrier sealing capabilities, tolerances, and out-gassing, hydrostatic and MVT reduction. Remove all loose concrete, brick or mortar from affected area by mechanical means. Surf aces shall be free of paints, oils, dirt, dust, curing compounds, sealers, form release agents or any material that would prevent mortar from coming into contact with the open pores of the concrete. Shot blasting, sandblasting, chipping and high pressure water blasting (3,500 psi) are all excellent surface preparation methods. Smooth concrete surfaces may require etching. Dampen area to achieve a saturated, surface dry condition (SSD). Leaving no puddles. Prepare concrete to remove laitance, form release agents, curing compounds, sealers and other contaminants and to provide surface profile in a ccordance with SSPC-SP13/NACE 6, ICRI CSP5. To repair large bugholes, and spalls, coarse aggregate or pre-approved fillers may be added. Pour liquid Part B into a container large enough to hold all components. With agitation slowly add Part A. When blended, slowly sift powder, Part C, while continuing agitation. Do not dump all of the Part C into the liquids at one time. Mix for at least two minutes or until the cement-sand is thoroughly wetted and a smooth consistency is obtained. Important: Do not add additional Part C.
Allow new concrete to cure 28 days, or until compressive strength has reached accepting levels. Verify dryness by testing for the presence of moisture with the “Plastic Film Tape- Down Test” (Reference ASTM D4263) or by other industry acceptable methods. When moisture is detected on horizontal surfaces, perform “Standard Test Method for Measuring Moisture Vapor Emission Rate of Concrete Subfloor Using Anhydrous Calcium Chloride” (Reference ASTM F1869). Moisture content not to exceed three pounds per 1,000 sq.ft.in a 24 hour period. Then proceed to mix, apply, and finish. If within recoat times, no preparation is required for subsequent lifts or top coats. Shelf life: 12 months, sealed. Storage: Store in a dry area aw ay from direct sunlight. The product should be conditioned to between 70º F and 90º F before use. Epoxytec Mortartec Ceramico is a new generation, epoxy modified mortar. A smooth mortar application with the hardest surface in the industry once cured. The Mortartec Ceramico is industrial-grade and exhibits excellent acid resistance unlike any mortar technology before it, with incredible adhesive properties, enhanced barrier sealing capabilities assisting with minimizing out-gassing, hydrostatic and MVT. Used to repair concrete and/or line. Often specified as a resurfacer, the mortar also acts as an enhancement to any subsequent epoxy top coat systems. With an open crosslink during initial cure it serves as a bonding layer and crosslinking system, boosting the adhesion of top coats and making any system cohesively improved and better performing in combination; the mortar serves as a self-priming underlayment, top coated with a variety of high-performance epoxies and urethanes for use when dealing in extremely aggressive environments. Mortartec Ceramico is a high-performance solution for lining, surfacing/resurfacing, patching and filling voids and bug holes on concrete substrates. The mortar may be hand or spray applied, typically from 1/16” to 1” in depth. Uses include repairing concrete walls, ceilings, lining brick or concrete infrastructure, etc. Mortartec Ceramico provides an extremely dense matrix and will accept coatings at earlier stages than typical Portland cement repair products. A true advancement in the world of concrete. The epoxy-modified-mortar from Epoxytec- Mortartec Ceramico was an R&D project that took 3+ years to perfect. Once the formulation of the right balance of epoxide resins, the latest technologies of curing agents and the correct blend of high performance aggregates were tested and established- born was a truly epoxy-based resurfacing mortar and lining system to enter the industrial markets. Not many mortars are more fitting for sewer environments in particular. Specified as both repair/resurfacing concrete solution or liner. 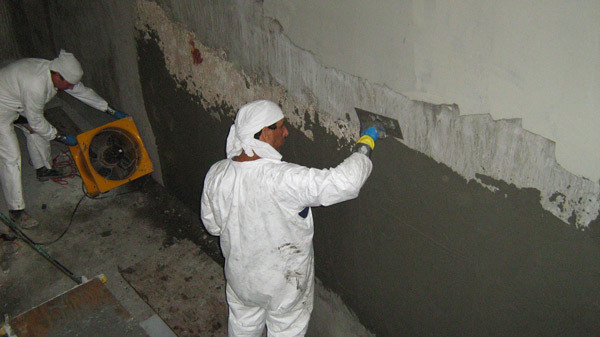 As a concrete repair, the Mortartec Ceramico is a highly adhesive repair mortar with incredible tolerances and curing properties, allowing re-coating or top coating within 3 hours in many cases (without the need for further prep) and retarding out-gassing process while providing an enhanced bonding layer, primer-like resinous acceptance for other epoxies or coatings. As a liner, the material cures with a sealed barrier to moisture vapor transmission (MVT), hydrostatic pressure, inflow and infiltration (I&I), and out-gassing. Applied like butter, and cured with one of the hardest surfaces in the market, the material can also be applied as thin as 1/16 of an inch, and upwards to 1″ per pass.